For the past week or so I’ve shot portraits of Goddesses for my local client Ashley Benem of Benem’s Body Works. Ashley contacted me through a friend of a friend. Upon first discussion, her ideas intrigued me and wanted to work with Ashley on her project. She needed various models dressed as certain goddesses for her calendar. These consisted mostly of studio sessions with a few outdoor shoots. For the studio, I used Einstein monolights made by Paul C. Buff. These lights are phenomenal. I borrowed them from my good friend Earnie Glazener of Seattle, Wash. I’ve used studio lights multiple times before, but these were fantastic. With a quick tutoring session, I realized I need to get me a set of them. For the main light, I used one with the parabolic light umbrella (The PLM system), which is basically a huge beauty dish and gives off some wonderful light. My fill was a basic soft box by Paul C. Buff. On some shots for more dramatic light, I used a Photflex reflector to fill in the shadows for more dramatic light. For the outside shots, I just used the reflector to fill in the shadow areas. After setting up the lights, I took a few test shots each day using my Color Checker Passport by X-Rite Photo. Just a few shots at the metered exposure and then a few more bracketed. The good thing with the Einstein lights is that they are extremely consistent with their color temperature. © Paul Conrad/Pablo Conrad Photography – Ashley Benem of Benem’s Body Works portrays the Greek goddess Artemis the Archer, Goddess of the Hunt, Forests, the Hill, and the Moon, during a photoshoot for her upcoming calendar. 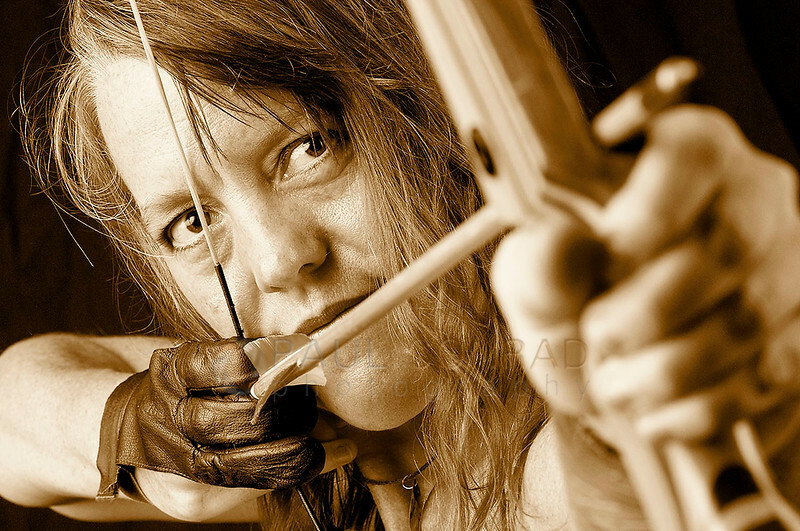 Lighting: What was important in this photo was the angle of her drawing the bow (it is a real bow and arrow) and the ability to see her eyes. Yes, the inspiration for the angle was the movie poster for The Hunger Games. A basic lighting set-up was used for this image. Ashley was simply lit with the large PLM umbrella on the left and a powered down soft box (2 stops under) on the right. Exposure was 1/250th at f/11 using my D300s with 80-200 zoomed halfway for a slightly compressed feel. Post Processing: Simply brought into Adobe Camera Raw to get correct color balance and add a little fill light. Brought into Photoshop and used separate layers for curves (slight increase in mid-tones) and Black & White layer for the sepia. Lighting: What was important in the photo was all the white with emphasis on the reds of the pomegranate and her lipstick, yet, still maintain some color for her skintones. The model was simply lit with the large PLM umbrella on the right and the soft box on the left as fill. I wanted less depth of field so I powered down all the strobes to their minimum. Exposure was 1/250th at f/4 using my D300s with 50mm f/1.4 focused on the pomegranate. Post Processing: I brought the image into Adobe Camera Raw twice: once for correct exposure and color balance, the second time to get the overall overexposed look. Those were then layered in Photoshop with the bright layer converted as a smart object and placed on top of the “correct” layer. I then used the eraser tool with the opacity and flow settings set to the mid-range on that layer to bring out the red in the lips and pomegranate of the underlying layer. I then added a curves adjustment layer to flatten the highlights and add just a touch of contrast. 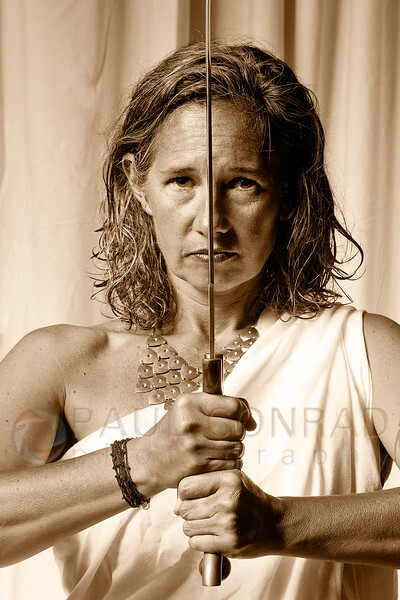 © Paul Conrad/Pablo Conrad Photography – Athena the daughter of Zeus, Greek Goddess of wisdom, warfare, architecture, divine intelligence, and crafts. Lighting: What was important in this photo is to make her look the part. Ashley did a great job coaching her to bring out the character as she did with all the models. While shooting, I had to pay attention to the sword because when it was turned the “correct” way, the glare was overwhelming. The model was simply lit with the large PLM umbrella on the right and using a Photoflex MulitDisc 5-in-1 reflector on the right using the gold fabric surface. I wanted less depth of field so I used my 80-200 to compress it a touch. Exposure was 1/250th at f/11 using my D300s with 80-200 f/ 2.8 focused on her eyes. Post Processing: I brought the image into Adobe Camera Raw for correct exposure and color balance. Then using Photoshop, I layered a curves layer to bring in the mid-tones and add some contrast by anchoring the upper shadow area. Then I added a Black & White layer to add the sepia toning. 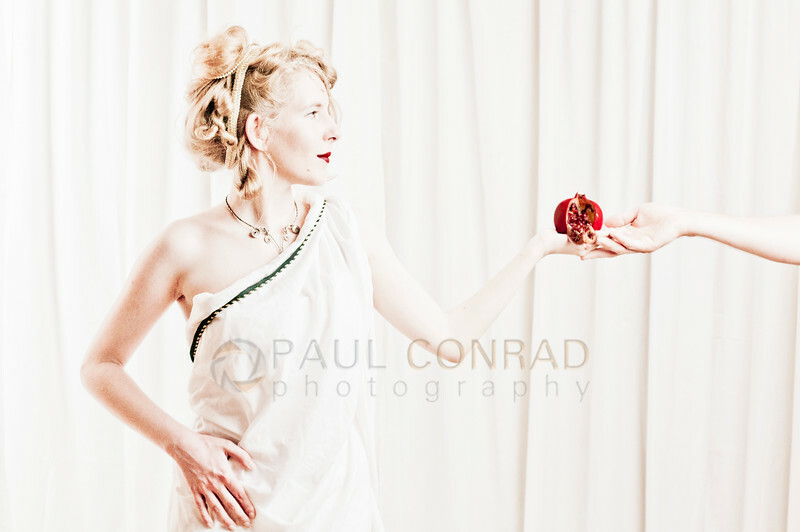 © Paul Conrad/Pablo Conrad Photography – Brighid the Celtic Goddess of Childbirth and Poetry. 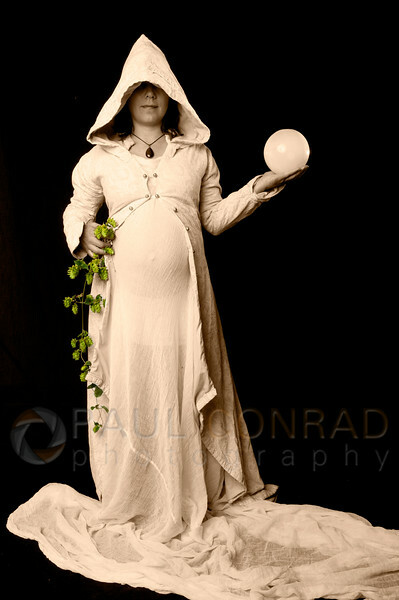 Lighting: What was important in this photo is to ensure the herbs on her left were properly lit as well as lighting the globe with a spot light so it has a glowing feel to it. While shooting, I had to pay attention to the globe to make sure the model held it in the spot where my snooted SB-800 strobe was firing. The rest of the model was simply lit with the large PLM umbrella on the left as the main light to keep the herbs well-lit. The right side was lit using a soft box set about 2 stops under the main. Exposure was 1/250th at f/11 using my D300s with 17-35 f/ 2.8 at about 20mm focal length. Post Processing: I brought the image into Adobe Camera Raw for correct exposure and color balance. I also made the shadows a little deeper to drop out the black background. Then after importing it into Photoshop, I layered a curves layer to bring in the mid-tones and add some contrast by anchoring the upper shadow area. Then I added a Black & White layer to add the sepia toning. With the B&W layer, I added a mask and using the eraser tool, deleted that part over the herbs to bring out the green. The opacity and flow settings on the eraser tool were set to the mid-ranges to keep the edges from being to stark. There are a total of 13 models for this shoot. Each one has their own special characteristics. Each one with their own special circumstances. These are just my 4 favorites.